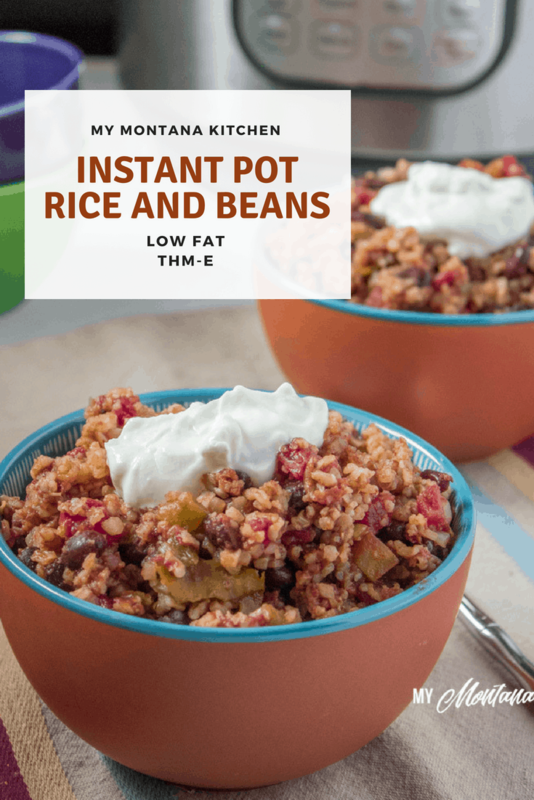 This Instant Pot Rice and Beans recipe is sure to be a family favorite. Brown rice, beans, spices, and all your favorite flavors combine to make this a frugal, hearty dish that is a cinch to make at dinner time. This recipe is low fat, dairy free (without toppings), and can be enjoyed as a Trim Healthy Mama E Recipe. 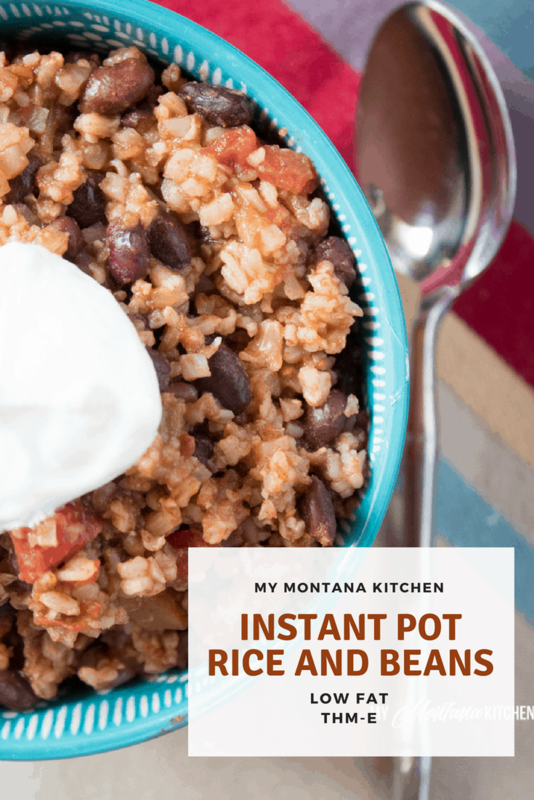 This Instant Pot Rice and Beans Recipe is one of the most requested dishes from my children. (I know, strange?) Seriously, they get so excited when I tell them we are having rice and beans for dinner. This easy meal has become a favorite here, and I have been making it in various forms for years. The first time I made Rice and Beans was after my husband returned from a ministry trip to Haiti. He had fallen in love with the Haitian red beans and rice. He googled how to make it and then tried to recreate that dish at home. It was so delicious, and I was impressed that even my small children loved it! But it was a pretty involved recipe, and over time I started using black beans in place of red, and changed things up to better fit what I had in my pantry. It soon became an item on our weekly menu rotation. But even then, I made it differently every time! I finally decided I should try to write down a specific recipe, so I could share it with you guys! Maybe it will become a family favorite in your house, too! Before my husband bought me an Instant Pot, I would make this dish on the stovetop. So if you haven’t joined the Instant Pot crowd, you can still use this recipe! I have tried using dried beans, but I really prefer using canned beans. This cuts down on the cooking time, and ensures that the black beans are nice and soft. Of course, you don’t have to use black beans, you could also use pinto beans, kidney beans, or any other similar bean. As I mentioned, my kids love this meal, and I couldn’t be more pleased! It gives them a great source of fiber, and it is very frugal. If you are looking for ways to cut down on meat, or ways to stretch your grocery budget, this Instant Pot dinner will be perfect for you! We like to eat the leftovers throughout the week. My husband and children top their rice and beans with sour cream for a THM Crossover, and I usually top mine with 0% Greek Yogurt and a squeeze of fresh lime juice (and maybe a little extra chopped cilantro)! If you want to make this dish a little more special, you can add some diced cooked boneless skinless chicken breast at the very end, after the pressure has released. And if you love cilantro, (like me), feel free to add a handful of fresh, chopped cilantro before cooking. That really ups the freshness of the flavor! Seriously, if you don’t have an Instant Pot yet, make sure to add it to your wish list! Using the Instant Pot, the cleanup for this Rice and Beans Recipe is super simple. 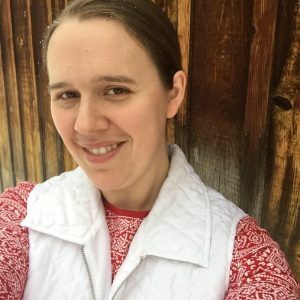 I have the Instant Pot DUO 6 Qt 7-in-1 model, and I absolutely love it! No complaints at all! Everything is in one pot (and I usually serve it straight out of the pot), making cleanup a breeze! This recipe is perfect for busy nights when I don’t have a lot of extra time to spend preparing a complicated meal. Throw the ingredients in, set the pressure, and forget about it! If you are looking for more Instant Pot Meals, check out my Sweet and Sour Chicken Recipe and Instant Pot Chicken and Rice Recipe. Brown rice, beans, spices, and all your favorite flavors combine to make this a frugal, hearty dish. Place all ingredients in your Instant Pot Liner. Close lid and seal steam vent. Process on Manual High for 22 Minutes. Allow to Natural Pressure Release for 5 - 10 minutes, then Quick Pressure Release. Hi Sarah….this recipe sounds delightful, but is there a reason why you couldn’t you use dried beans? I make black beans by the pound in my IP and freeze them. (in fact, I haven’t used canned beans since I got my IP). They are much more economical and taste way better than canned ones. Do they break down too much in this recipe? Interested to know before I waste a ton of ingredients. I know you test all your recipes thoroughly and I love them all! Thank you so much for helping us all stay on the THM plan with your tasty dishes! My instapot does not have a manuel button. Do you use pressure cooker, steam, rice? I would use the pressure cooker button. I dump all the liquid in. I did use the pressure cook button and after 10 min the pot errored with burn. I added more fluid and tried again and it did the same thing. do you have any suggestions? I have never seen that code on my machine. Is your Instant Pot new? It seems that some of the newer IP’s may have a defect of some sort that causes them to give that error code. I’m not really sure, but here is an article that can help you troubleshoot why the burn error code may have occurred.